Greece is one of those destinations that truly has something for everyone. History buffs will revel in the ancient architecture and remnants of bygone civilizations. Foodies will appreciate the fresh seafood and delicious, traditional fare. Adventurers can spend their days hiking across mountains, and party animals are welcome to dance the night away on eclectic islands. 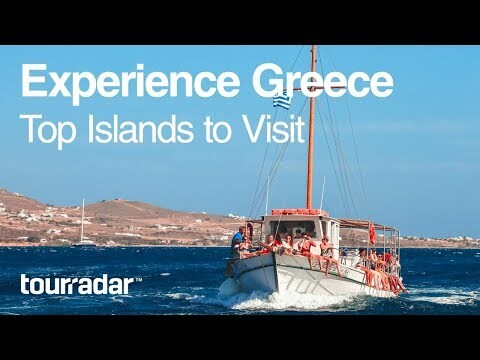 If you’re looking for a beach vacation, or you want to fully immerse yourself in the culture of the Mediterranean, Greece is the perfect option for you, and today we’re exploring just a few of the islands. If you’re looking for the perfect island to let off some steam and party all night, Mykonos is for you. Enjoy massive dance clubs, parties on beautiful beaches, and some of the world’s most famous DJs there to provide the soundtrack. Of course, if relaxing on beaches, strolling through museums, and hiking to reach stunning island views is more your speed, you can do it all here. The best part of Greece is that every island seems to work double-duty! Slow things down a bit and move on to Paros, an island in the Aegean Sea. Here, explore traditional villages, a church constructed in the 4th century, and some of the best beaches Greece has to offer! Perfect for lounging as well as exciting water sports such as windsurfing, the beaches in Paros are second to none. If you’ve pictured what it would be like to spend time on a Greek island, chances are you were picturing yourself in Santorini. This island gem includes iconic blue-domed buildings, colourful, cobbled streets, and red, black, and white-sand beaches. Visit the Santorini caldera, an undersea volcanic crater that was responsible for the massive eruption that formed the island as it’s known today in the 16th century BC, or just perfect your Instagram game! Ios is another island offering the best of bost worlds! Not only are travellers able to join in on the large parties that take over the island during the summer months, they can also enjoy some world-class hiking on along the cliffs and lush green spaces found all over the island. Crete, the largest of the Greek islands, is the mythological birthplace of the god Zeus – but that’s just the beginning. The island is also home to white sand beaches, soaring mountains, a world-renowned archeology museum, and a preserved bronze-age settlement called Knossos. You never run out of things to do, places to eat, and amazing sights to see! If you can’t resist the call of the Greek islands for any longer, shouldn’t you be planning your escape? We agree! Head over to TourRadar to find the best deals on this itinerary, as well as many other amazing Greek tours.